The Cool House: Cork or Wood Flooring? Help! 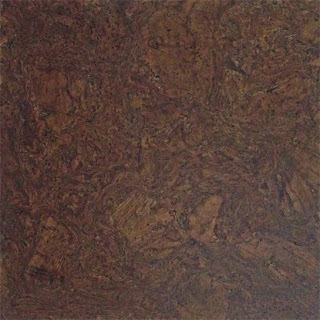 Now we've decided to go for it, the only thing holding up the kitchen renovation is the flooring choice. I've gone over it a bezillion times and I'm no nearer reaching a conclusion but the kitchen cabinets are about to be ordered so I need to make a decision right now. Here are the issues: We have a sink, water dispenser in fridge. two dog bowls, cook top and wall ovens - that's a lot of potential spills. There are seven (7) doors/entryways to this room - it flows into the foyer, powder room, dining room, great room, mud room and basement and then there is the sliding kitchen door. The foyer and great room have waxed mahogany/walnut parquet floor, the dining room is presently carpeted and the mudroom, which is off at a 120 degree angle, should have the same floor as the kitchen. 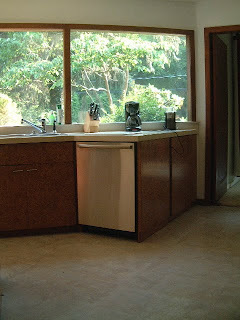 Oh, and did I mention the kitchen is a trapezoid? I need the floor to be the same level as the parquet; I don't want anything as visually intrusive as a saddle nor do I want to trip over the transitions. So no slips no trips and as unified as possible. Also eco-friendly and able to stand up to two large dogs and four indoor/outdoor cats. Then there's the New York winter with its mud, snow, ice and ice melt trekking throughout the space and the Long Island summer - pool water and chlorine plus sand from the beach. Ceramic/Porcelain/Stone tiles are not an option here - too hard on the feet and too cold (we don't have room for radiant heating). I had planned a cork floor for the kitchen - green, easy to install and soft underfoot. The tiles are square so will follow the same pattern as the existing vinyl that works for this space. They can either be waxed or polycoated to seal and are to a certain extent self-healing in the natural state. The flooring guy asked to quote for the job tells me it will be more expensive than wood floors and more easily damaged. I think he's balking because he's used to hardwood installation. His argument? Wood floors can be stained any color, sanded down if they get damaged and are better for resale (not that we're considering selling). Interestingly, Paul Anater of Kitchen and Residential Design had a post on cork floors last week that's worth reading. I'm leaning toward cork floors for our kitchen. I saw samples at the Bungalow Expo in Chicago, and fell in love. The rep there said it was a very sturdy material, but you'd expect him to say that. The only reason I'm hesitant is because I don't know anyone who has done it yet. But they sure are pretty. I made the *gasp* mistake of placing cork floors in a showroom once. Water from a huge cooler spilled. Tiles curled up in every direction causing trip hazzards. Though many do use cork in wet areas with success, Never could I recommend cork in a wet area. We did cork in our upstairs hallway. On an individual tile it looked cool; on an entire expanse, the color looked like particle board. We put down a runner. To be safe, I say wood. Terrazzo. I don't know if it is on your radar but i just love it. Cork, cork! I put cork in my kitchen and I love it. It looks way better than my hardwood which I re-sealed at the same time. I haven't dumped gallons of water on it or anything, but I am a messy cook; no issues so far. Cork! :) Although -- if your floor guy is wary of it because he's inexperienced, best find someone else or order from duro-design and install yourself. It's not difficult. A lot of people I know have cork in their kitchen. We have it (it was already here when we moved) and it's great. It has a polyurethane finish and it can be sanded and refinished if it does get knocked about. i read that on the other guy's blog that he recommends the dogs claws to be clipped if you choose a cork floor. Can't wait to see what the result will be, 'cause i know it'll be stunning. Usually the brightest room in a home, it stands to reason that the kitchen is the place where family, friends, and guests often choose to congregate. My sister has stunning cork floors in her basement, and they throw the ball for their bloodhound all the time. No issues at all.